When used for collapsing, the documents will only be considered equal if all the values specified match. If none of the specified values are set then the generated key will be empty, so such documents won't be collapsed (which is consistent with the behaviour in the "collapse on a value" case). If you'd prefer that documents with none of the keys set are collapsed together, then you can set reverse for at least one of the values. Other than this, it isn't useful to set reverse for collapsing. 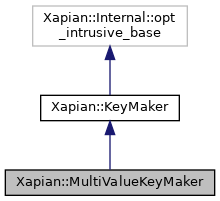 Construct a MultiValueKeyMaker from a pair of iterators. The iterators must be a begin/end pair returning Xapian::valueno (or a compatible type) when dereferenced. defvalue Value to use for documents which don't have a value set in this slot (default: empty). This can be used to make such documents sort after all others by passing get_value_upper_bound(slot) + "x"
this is guaranteed to be greater than any value in this slot.